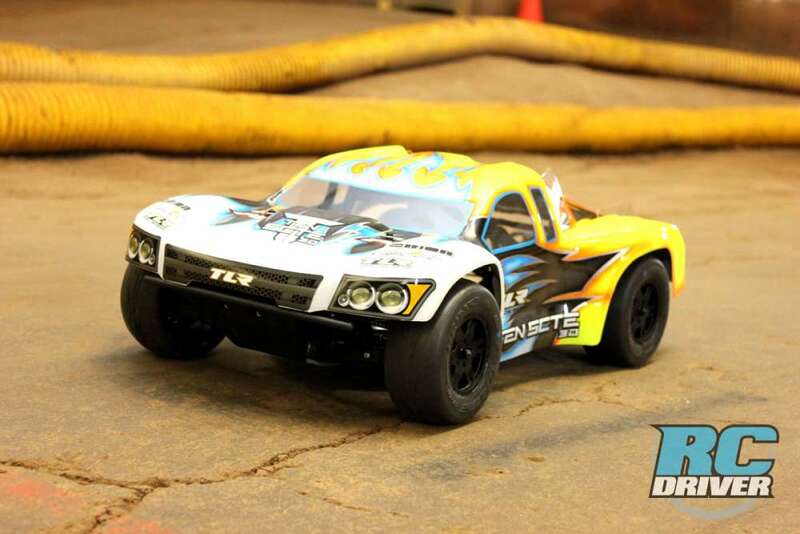 When you hear the RC term Truggy, most people think about 1/8 off-road truck style vehicles with either a nitro engine or a potent electric system strapped in ready to do battle on the track or tear up a backyard. Things are changing a bit and Losi has unleashed a new truggy for the 1/10 enthusiast and its nestled into their popular Tenacity series and based on the ever so popular TLR 8ight design. 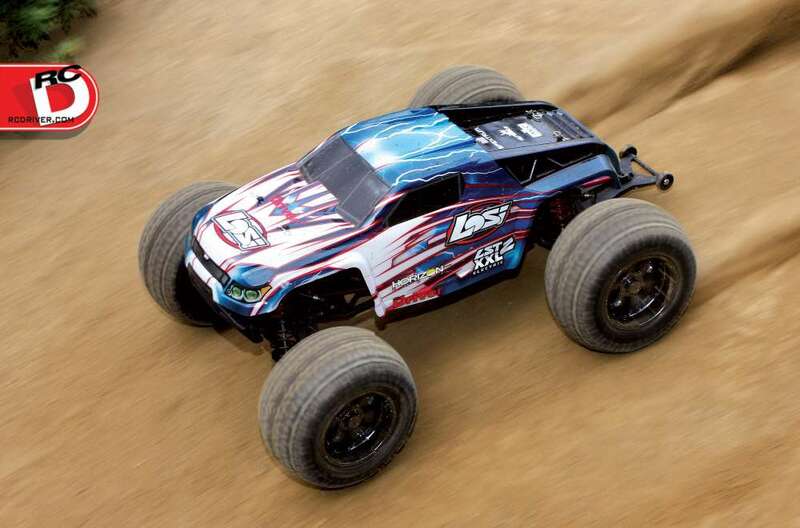 The Losi Tenacity-T 4WD Truggy comes ready to run with AVC equipped Spektrum radio system, Dynamite brushless system and it is capable of reaching speeds up to 50mph. This truggy from its wild graphics on the body to user friendly chassis layout screams fun backyard basher. 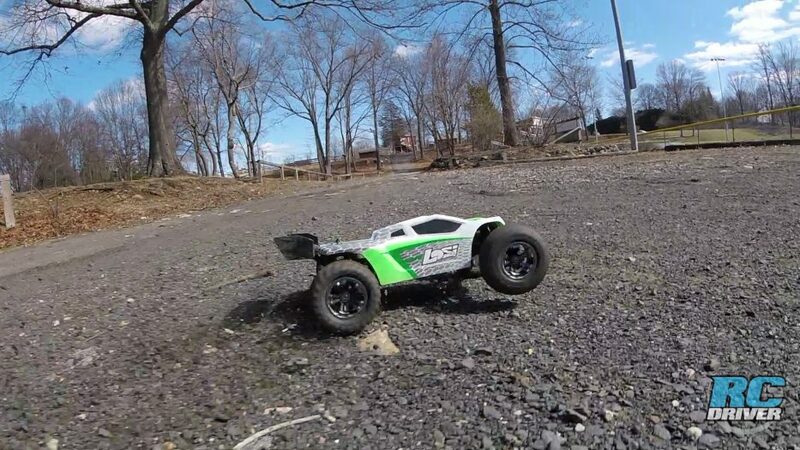 Here we’ll take a quick overview look at the Losi Tenacity-T and let you know how it performs. 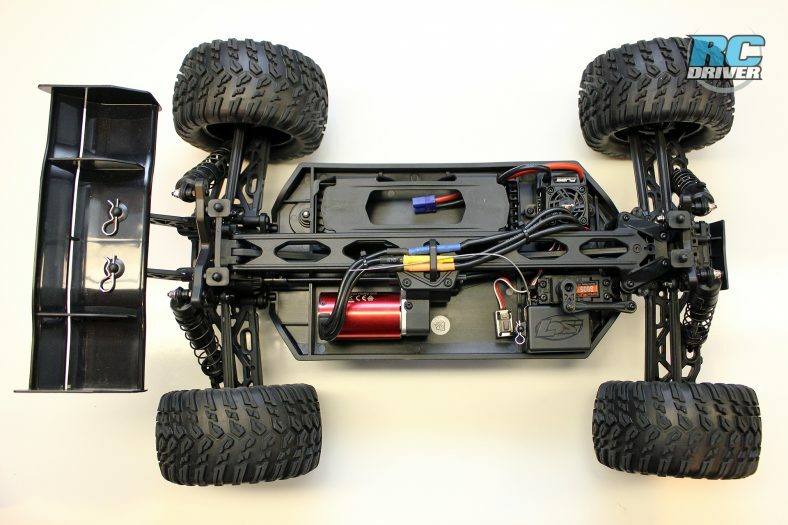 The truggy gets a long molded composite chassis as the foundation for the truck. There is a battery hatch located on the bottom of the chassis so you can easily remove the battery without having to remove the body. A small cam like mechanism secures the hatch and unlocks by using the included chip to turn it 180-degrees. 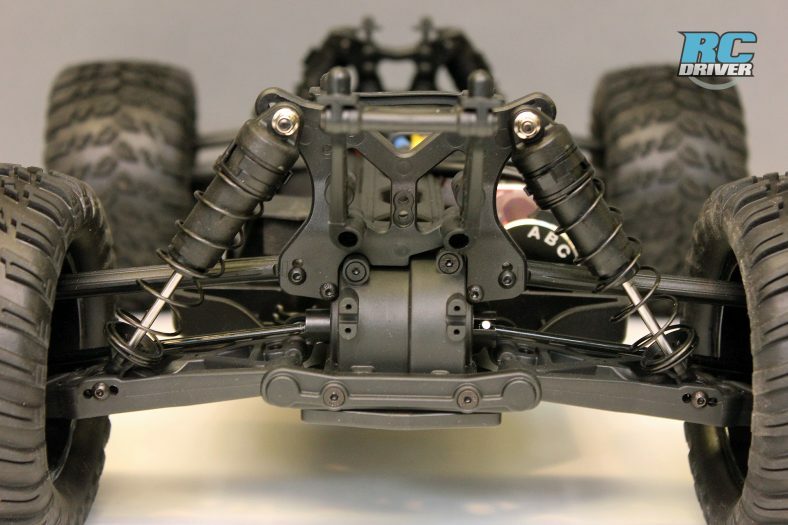 On top, the chassis has lots of bracing, including the chassis stiffeners we’re used to seeing on the 8ight based vehicles. 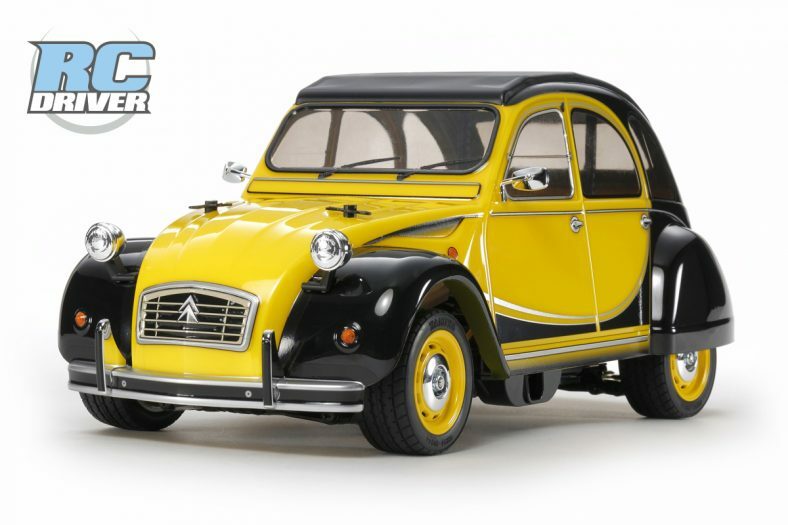 You’ll also find the 8ight style dual bellcrank steering with built in servo saver, a long top deck and ample space for the electronics package. Although some changes have been made, you can still see some 8ight suspension inspiration integrated into the Tenacity-T. Large 12mm bore shocks damp the suspension and mount to composite plastic shock towers. 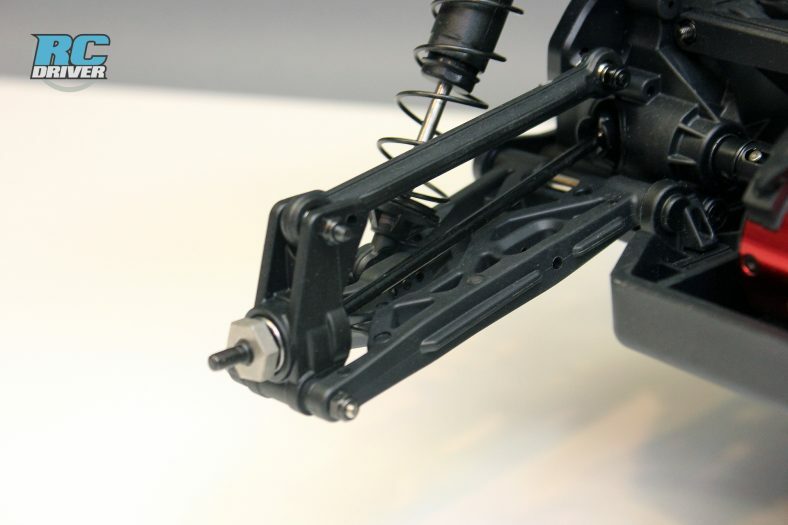 Rigid lower arms and fixed upper links are secured to the gearcases with aluminum hinge pin plates with plastic pin covers. 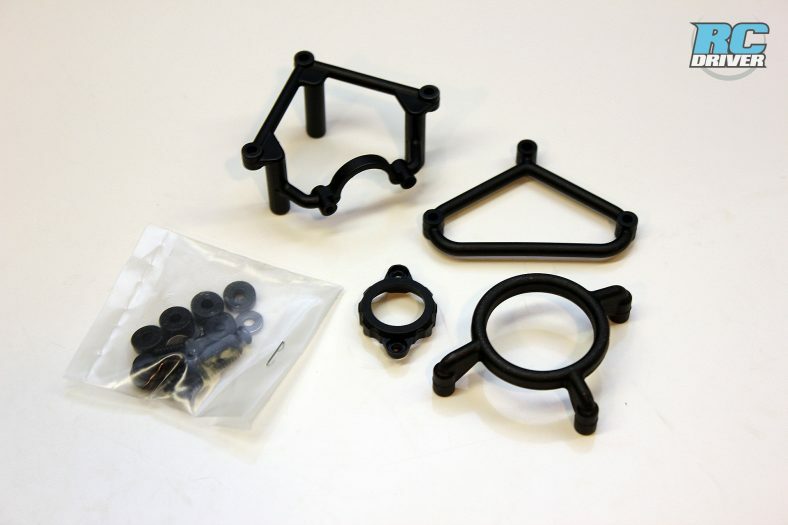 The shock towers are composite plastic and the hubs, steering knuckles and caster blocks have all been pulled from the 8ight inspired TEN family which are proven components that work well in racing and will work well here on a basher machine. 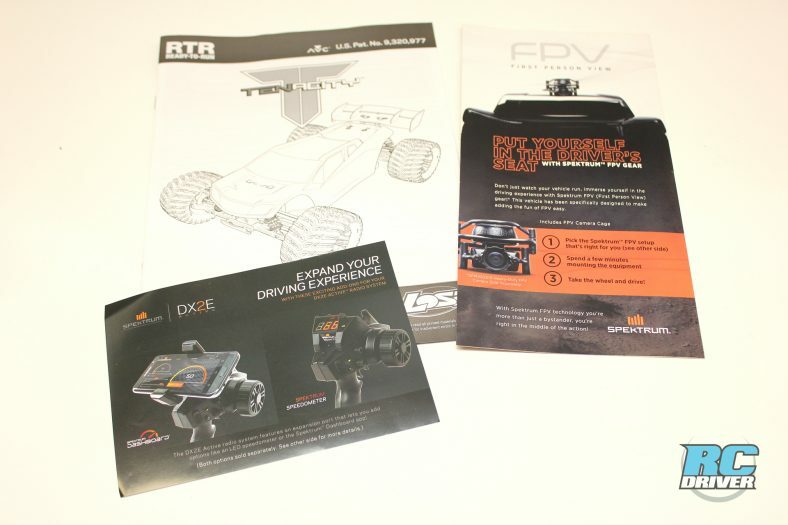 Good news in the driveline department, the design has been picked up from the famed TLR 8ight driveline design here too. You know, the one that has one a ridiculous number of races on many competition levels. 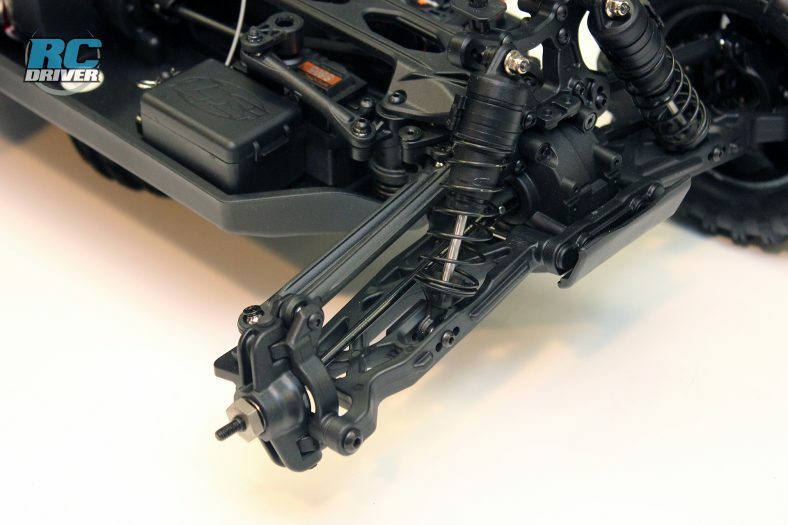 This off-set drive system allows for a well balanced chassis set-up. 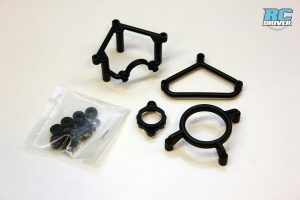 But back to the components themselves. You’ll find three gear diffs mounted in the truck; front, center and rear all with steel gears and steel outdrives. The driveshafts are universals on all four corners with dogbones used in the center of the truck. Of course everything rides on ball bearings. 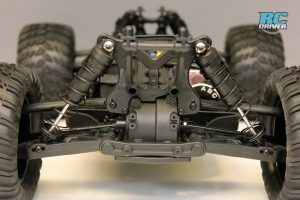 Where the driveline differs from some of the other TEN vehicles is the center diff gear and pinion are now in an enclosed case so no dirt and debris can get in to destroy the gears during your backyard play sessions. The Losi camp has access to some great electronics through it’s family brands. Control for the truck comes from a Spektrum DX2E-Active radio. This sport radio is equipped with some great features from basic trims to digital EPA adjustments. And you can use the port on the top of the radio to upgrade it with the Spektrum Spedometer or Dashboard. 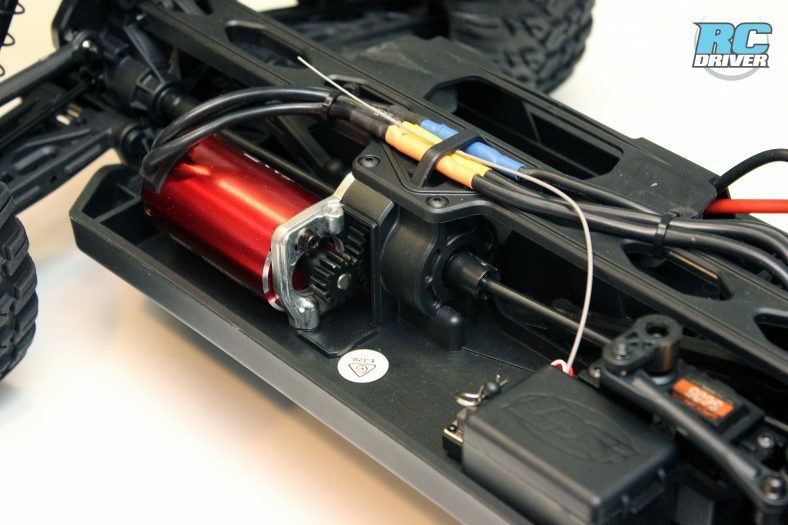 In the truck a Spektrum S605 servo takes care of steering and a Dynamite sensorless brushless motor combo handles power. 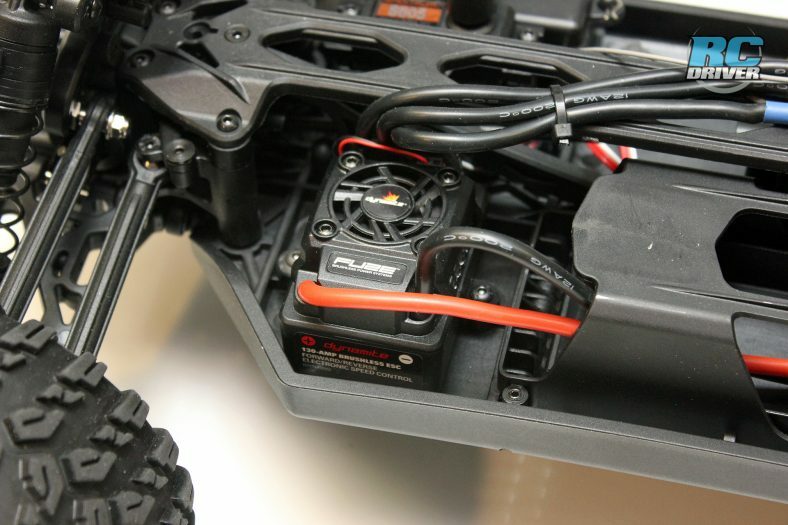 The Dynamite Fuze ESC 130A ESC can handle 2S or 3S LiPo batteries, just keep in mind it comes equipped with an EC3 connector. 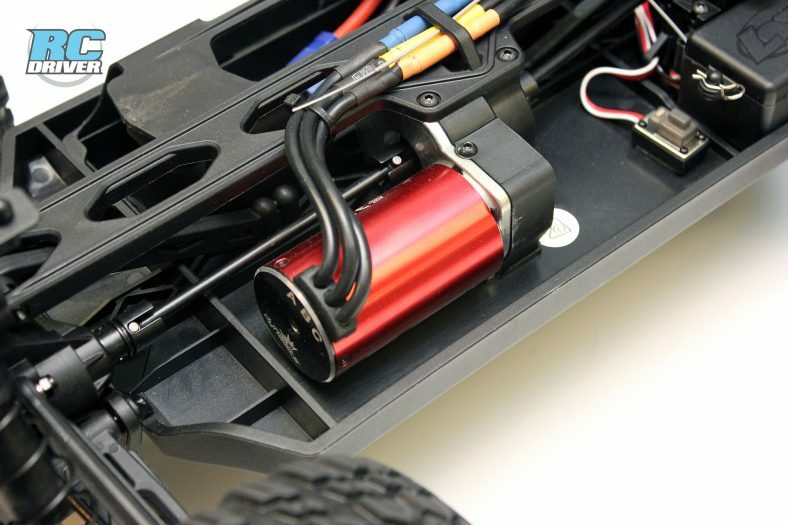 The 4-pole 3800kv Dynamite motor should give you plenty of scoot and remember to use to the proper pinion when using a 2S or 3S battery, Losi gives you both in the box. Most of the electroncis are waterproof, but the receiver is only protected by the box it’s in, so don’t go submerging your truck in water, general mud and wet grass driving shouldn’t be an issue. Testing took place during the winter at a muddy BMX park. 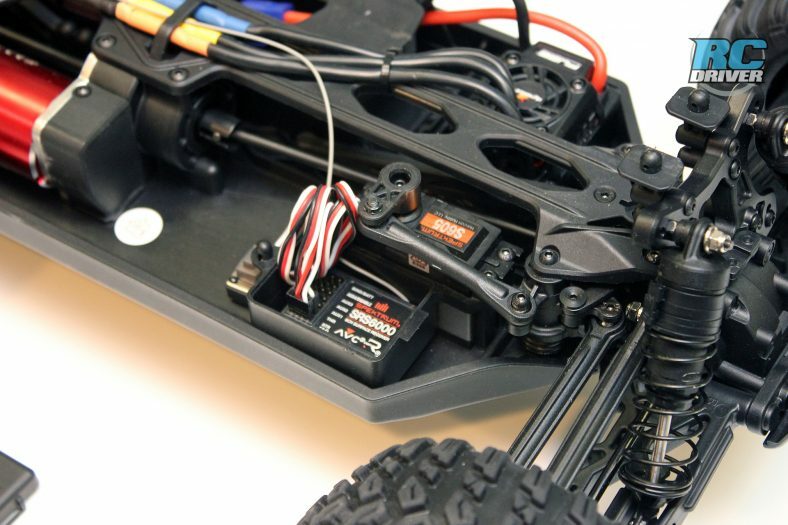 The Losi Tenacity-T had a new fully charged Dynamite 3S Reaction LiPo battery slipped into it’s tray for power and we went to town testing this exciting vehicle. 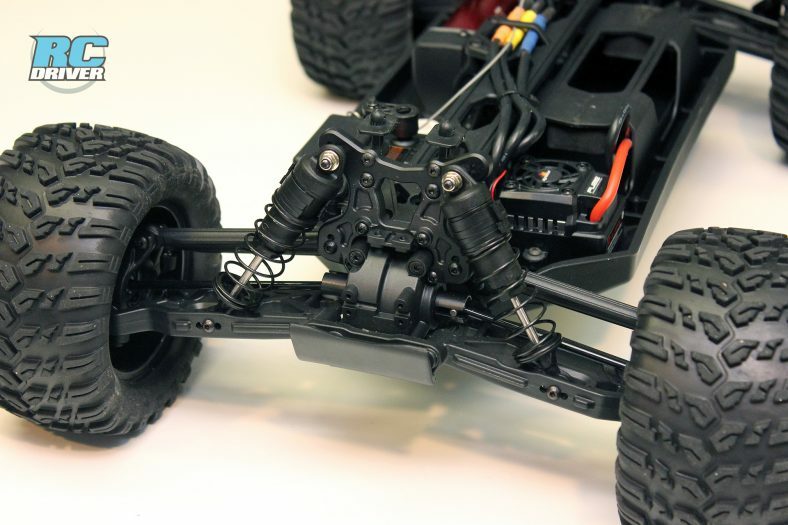 Steering- This truck has plenty of steering for backyard basher use with the included Spektrum S605 servo pushing the dual crank steering. 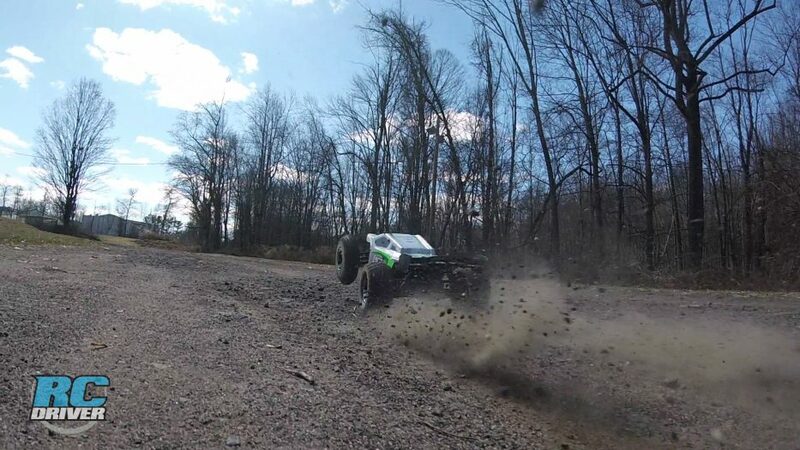 Ripping around in close range in grass and dirt, the truck went where we pointed it. 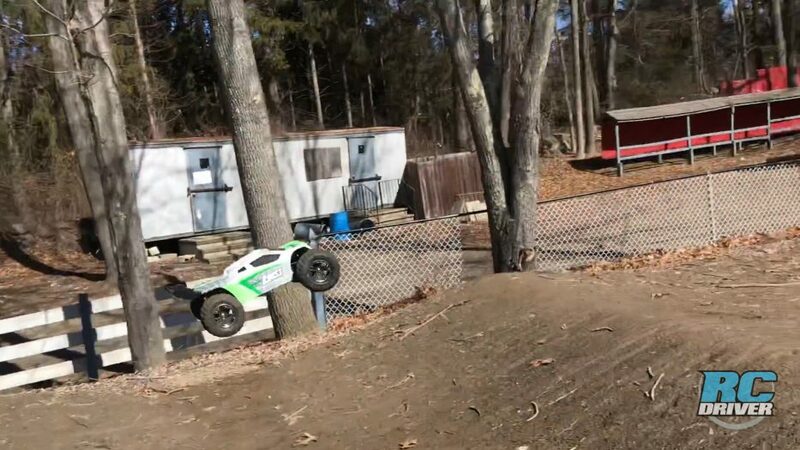 Sure it hooked in the grass and even flipped a few times while on power because of the traction from the tires and on the other side, it can also push a bit on power in the loose stuff. We had the AVC turned down a bit for our liking, but could still feel the steering assist kick in a bit and help keep the truggy under control which helped keep the fun factor high. 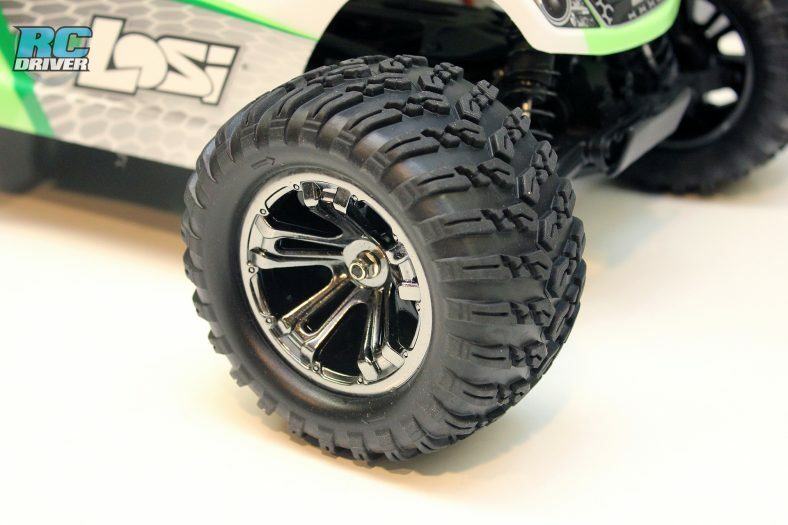 Jumping and Handling- This truck handles rough terrain well thanks to it’s plush race inspired suspension. The suspension worked over time on the ruts of the truck and kept the chassis level. Jumping was pure awesomeness! This truck has lots of speed to push it off of jumps and flies high and far. Just be careful not to hold too much throttle in the air, or the nose will point skyward and you’ll need to tap the brakes to get the nose down for a good landing. Acceleration- This truck is fast! Although we didn’t speed test it, it certainly appeared to hit the claimed 50mph speeds listed on the box with the 3S battery and included 12T pinion we installed in the truck. This thing tears up the grass, dirt roosts are plenty and speeds are certainly exciting for the entire run. Durability- A wheel randomly ejected from the truggy during testing and luckily the hex and pin did not fall off when it happened. What was even more lucky was the wheel nut was one foot away from where we stopped the truck. A quick wheel install with the included tools and we were back on our way. It never happened again and the Tenacity-T delt with all of the torture we put it through. 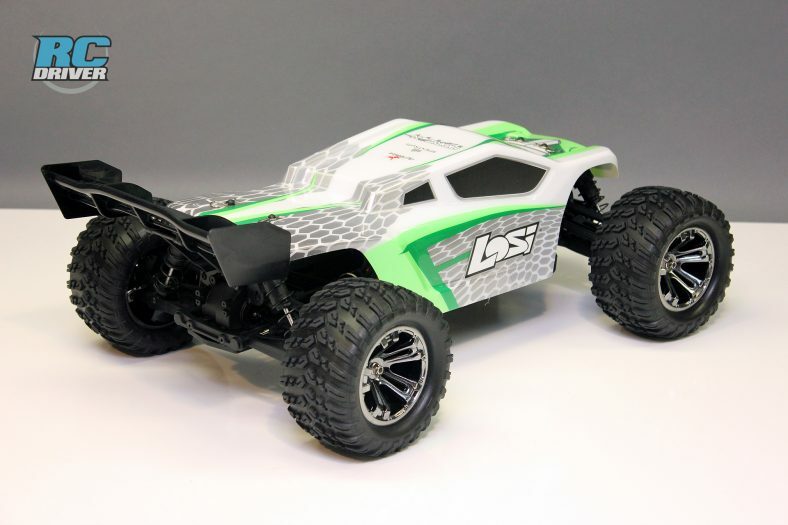 We’ll get right to the point, the Losi Tenacity-T is an awesome backyard basher truggy. This truck is the perfect size, speed and delivers on handling for those looking to have a great time in any basher situation. The electronics package is great, the truck looks cool and there is of course plenty of parts support if something were to happen. 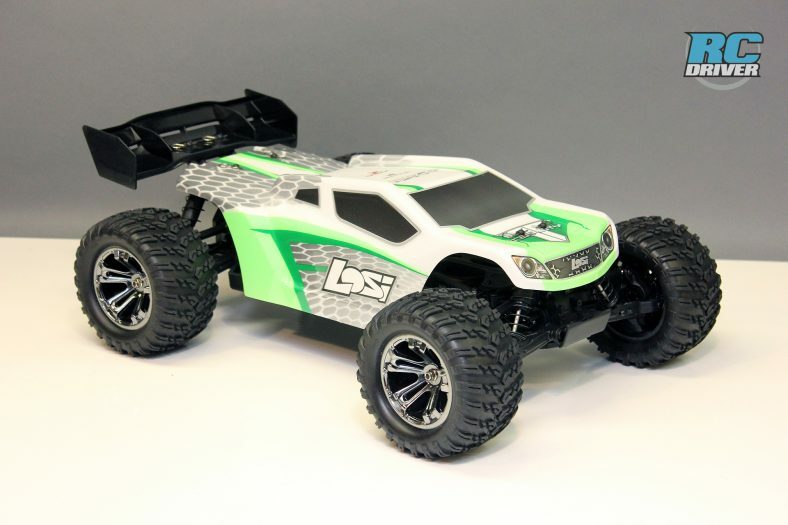 We also like the option part and accessory support Losi/ Horizon offers for this machine. 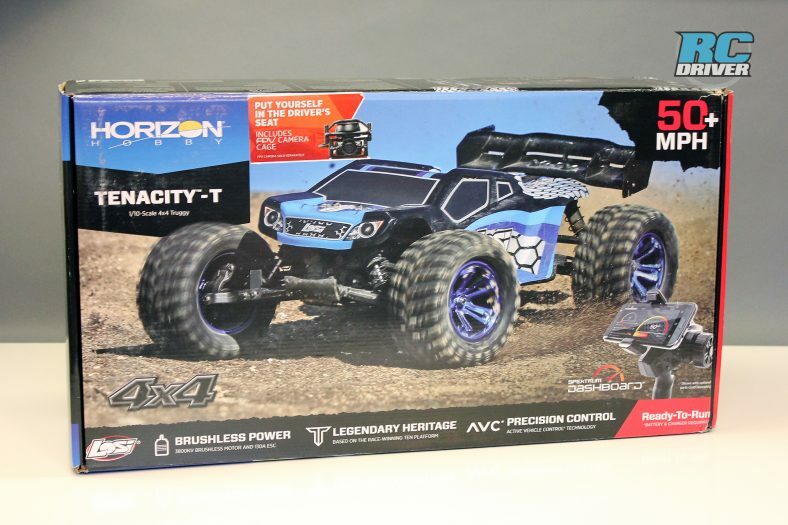 This isn’t a truck you’ll get bored with, you can grow into it and keep upgrading it to keep your RC hobby interesting.